Hello all. I've read several reports of listeners (and reviewers) putting Heresy's on stands to get the tweeter closer to ear level. Anybody here have experience and or tried this approach? IMHO, there is a significant difference between the H1/2, and the H3s. The H3s are a much better speaker and have more bass response than the previous versions. Absolutely no need to put them on stands. If you order some, order them with slanted risers, that's all you'll need. Don't do it with sub(s). Bass response dropped like a rock for me. Mids and highs were appreciably better, but not at the expense of losing most bass. I have three pairs of Heresy III's. One is on the original low risers. Two pair are on stands about one foot high. They all sound very good. The bass of the ones on the stands is the same as the pair on the low risers. 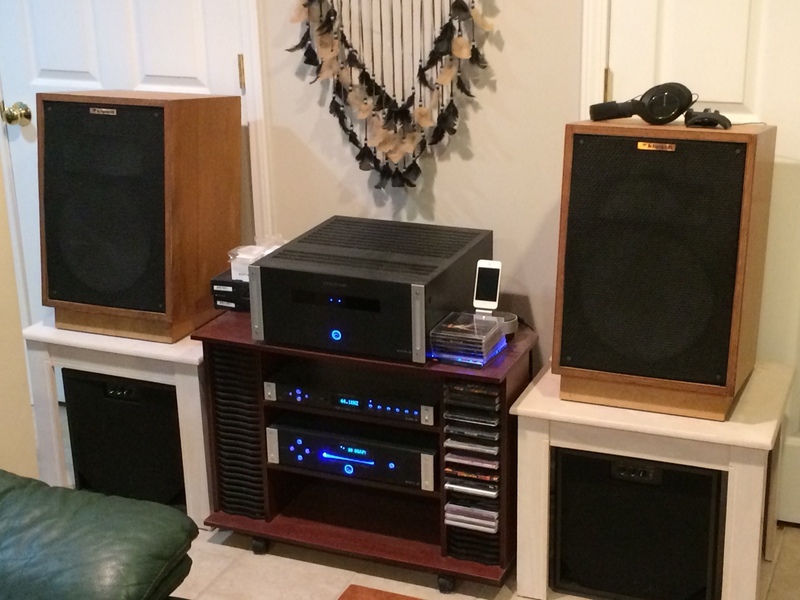 "The bass﻿﻿﻿﻿ of the ones on the stands is the same as the pair on the low risers." The bass of the ones on the stands is the same as the pair on the low risers. Interesting indeed....are you able to play them separately and compare or are you listening to both at the same time and making that judgement? Just wondering. If using a proper subwoofer go for it. With no sub it will detract from the already anemic bass response. Yes i have Jim. If you are used to full range performance anything not full range sounds like its missing something, because it is. I was surprised, yes but it still needs a sub. It's a great speaker for the size though. I have only run mine with a sub crossed in around 60 Hz. The sub is heavy, want to leave it for now. Doubt if 58 Hertz is enough. But got say, the Heresy iii has more bass than the previous models. They did seem lightweight. The Hiii better balanced. I have always paired my Heresy with subs so I use end tables. I place the Heresy on top and the subs underneath and it works fantastic. If you close your eyes you would think you are listening to Fortes. Not really a stretch since most people feel Heresy need a sub or two anyways! Thank you Jim. I actually have KLF-30 in place of the Heresy and subs now, but they sounded wonderful together. Are the stands "legs" or are they solid/or with a wood apron around the stand to avoid a cavity below the speaker box? 5. Freedom from cavities. The space under a speaker box formed by mounting it on legs can destroy the bottom octave of response and deteriorate the next 2 octaves. Some people on the forum have put rigid, solid wood "aprons" around the riser or stand, flush with the front, sides, and backs of the speaker, to avoid a cavity. An alternative is to put a solid block of wood under the speaker, the same length and width as the bottom of the cabinet, going all the way to the floor, firmly attached to avoid rattles. Or, bookshelf speakers can be put on a bookshelf with cabinet doors that don't rattle, placed below the speakers. I haven't heard the H III, but, all in all, it may be best to crossover to a sub, Xover point found by experiment. But, there are those who prefer to avoid subs sometimes because of clarity issues, sometimes not. Westcoastdrums, above: "Heresy III was far from anemic in my room, very balanced with excellent bass even two feet from thd back and side walls. I actually preferred them without a sub." My dream is to have one of those huge, ceiling to floor horn subs (DIY) with low modulation distortion. My Klipschorns have nice tight bass, so I find myself playing some music without my sub operating, especially trumpet, sax, etc., because air and space around the instruments seems to open up that way. That is what I imagine a horn sub might do; lots of bass, without much modulation distortion or muddying up.